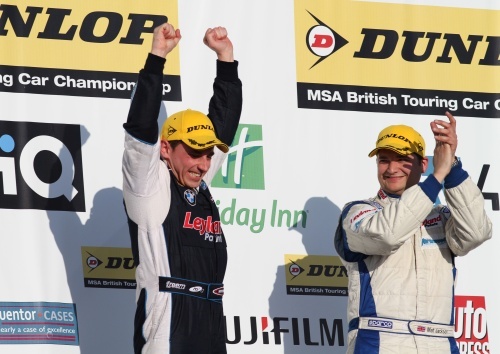 Steven Kane claimed his maiden British Touring Car Championship victory in the third race of the day at Thruxton, leading home his team-mate Mat Jackson in a one-two finish for the Motorbase BMW squad. Steven, who spent last year as the test driver for the Formula 2 championship, resisted extreme pressure from his team-mate to beat him to the chequered flag by a second after 18 hard-fought laps. Behind them, Jason Plato finished third for Chevrolet, Gordon Shedden fourth for Honda and Fabrizio Giovanardi fifth for Triple 8 Vauxhall. Those results mean that Giovanardi left Thruxton with a nine-point lead over Plato in the championship. Paul O'Neill finished sixth in his Tech-Speed Honda while seventh and eighth places for Arena Ford team-mates Tom Onslow-Cole and Tom Chilton represented the first BTCC points for cars powered by LPG engines.